I found a painted turtle one afternoon at Roxbury Falls, a beautiful turtle with bright markings and a perfectly formed shell, very healthy. Somehow it had safely negotiated the falls and escaped the attention of fishermen and curious boys. 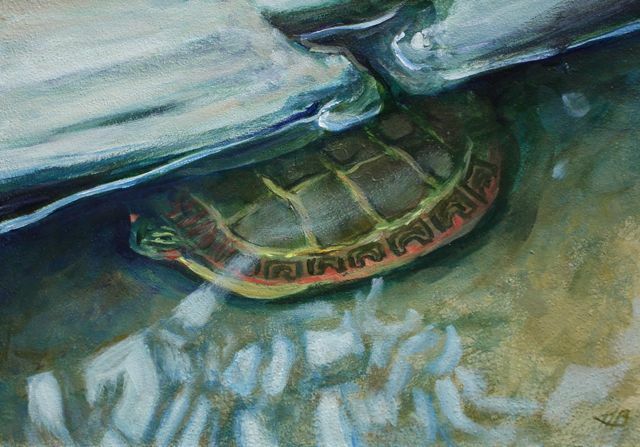 This painting shows the turtle as I found it, half under a rock shelf, underwater, quietly waiting for me to go away. Curious, I set my watch and sat by to see how long it could stay submerged. Ten minutes later, burned to a crisp by the sun and plagued by biting insects, I gave up. Next time I hear someone say "don't hold your breath" I'll think of this little guy. And so here I am on a Monday morning, the artist, a painted turtle, not quite ready to come out and take on the world yet, holding my breath as long as I can.